The Dormy House at Pyle & Kenfig is a self contained property situated within the grounds of the Golf Club, and is the perfect place to stay when golfing at P&K and the Porthcawl area. 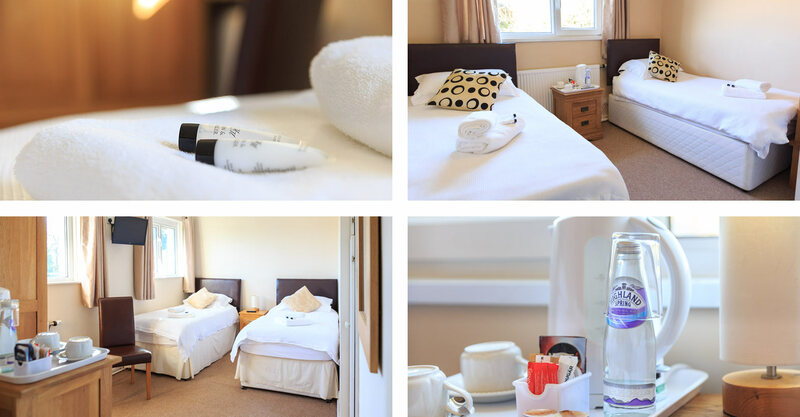 The Dormy House can accommodate up to 8 guests in 1 Executive twin/double and 3 standard twin/double bedded rooms; all rooms are ensuite with views out over Waun y Mer common. Your traditional Welsh breakfast and other meals are served in the Clubhouse where Dormy guests have access to satellite television and the bar facilities as temporary social members of the golf club. A stay in our Dormy House enables you to immerse yourself fully in the experience of links golf, with the luxury of being able to roll out of bed onto the golf course. * Prices Per Person Based on Sharing a Twin Room. Single supplement of £ 20-00 per night will be applied. Golfer Itinerary 2 night’s accommodation, plus 3 rounds of golf for the golfers at P&K - £220 P.P. With its lofty sand dunes hugging the coast of South Wales, Pyle and Kenfig is situated in a wonderful stretch of golfing country. A championship golf course, outstanding views and immaculate greens are just some of the reasons to visit P&K. Located in the Kenfig National Nature Reserve, a course ranked in the top ten in Wales - just some of the compelling reasons to join us. Friday 18th January - Past Captains Dinner at the club for Mr Steve Rock - please add your names to list in the foyer. The perfect place to stay when golfing at P&K and the Porthcawl area. If you are interested in holding a function at the Club, please call the office to discuss your requirements. Try out our indoor Golf Simulator.